Restaurant Mozaic in Bali by Chris Salans advances as the only representative from Indonesia on this prestigious list. The euphoria surrounding the Academy Oscars Award was undeniably far-reaching and contagious, that there were live screenings for private groups at several cinemas early morning on Monday, 25 February 2013 in Jakarta. Unknown to many, across the globe from the Hollywood, we in Asia were brimming with excitement about an event that was about to take place for the first time ever. 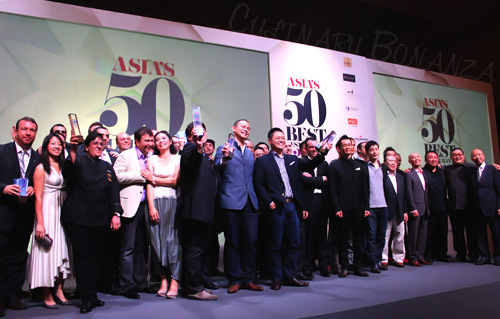 Just a few hours after the Academy Awards was broadcast live from California, the inaugural presentation of Asia’s 50 Best Restaurants took place at The Sands Grand Ballroom of Marina Bay Sands, Singapore. 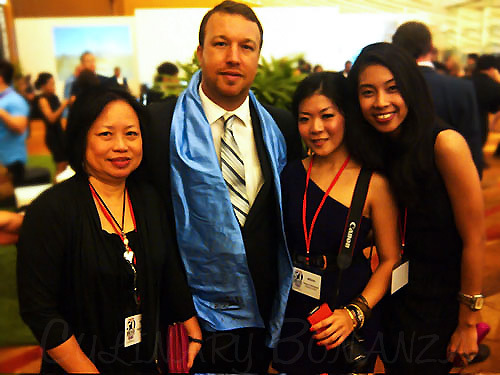 For culinary enthusiasts like me, this event was like the Oscars for Asia’s restaurant world. Scale and fashion wise, the comparison may not be entirely valid because the event concerns audiences who are majorly in Asia and there weren’t much fashion to observe as most of the guests were male chefs. However, this list is a long-awaited mystery that has been tightly kept right until the announcement moment and need I mention that these talented male chefs are good looking too? The list is supposedly an unbiased reflection of the region’s culinary gems, but the public may not necessarily agree with the results and rankings. Nonetheless, it serves as recognition for restaurants that have, in some way, had a positive impact on the region’s dining scene over the past years. So, besides ranking the 50 select restaurants, the program also serves as a platform to present special awards by the sponsors such as Asia’s Best Pastry Chef Award sponsored by Cacao Berry, One To Watch Award sponsored by LesConcierges and Lifetime Achievement Award by Johnnie Walker Blue Label. The event started with a cocktail party at the ballroom’s foyer. It may not have been the Oscars’ Red Carpet, but the stellar chefs present would make any food enthusiasts excited and star struck for good reasons. These prodigies came all the way from as far away as Sri Lanka and notwithstanding their normally extremely busy schedules, they are taking the time to attend the ceremony. It was quite obvious when a familiar face was spotted among the good looking yet unfamiliar chefs and guests during the pre-ceremony cocktail. It was none other than Chris Salans, the Owner and Executive Chef of Mozaic restaurant in Bali. Since he was the only restaurant owner from Indonesia that evening, Mozaic must have won Best Restaurant in Indonesia. However, nobody knew what its ranking was, yet. The ceremony kicked off with a speech from William Drew, Editor of William Reed Business Media and Sue Woodward, Director of The World’s 50 Best Restaurants and Asia’s 50 Best Restaurants. A convivial and witty persona that is regularly seen on the cable TV network, Oli Pettigrew, hosted the announcement of the winning restaurants and chefs. All of which happened within just a solid 50 minutes. Unfortunately for Indonesia, the suspense did not last longer than the first 5 minutes since Oli Pettigrew began ranting on the stage. Mozaic Bali is ranked number 50 on the list. Other highlights at the award ceremony included The One To Watch Award which went to JAAN, Singapore with Julien Royer as the Executive Chef. The Best Pastry Chef award went to Janice Wong, Owner and Founder of 2am:dessertbar, Singapore. China was the star of the evening, which contributed 16 restaurants on the list (most of which are concentrated in Hong Kong) and Singapore came in next with 10 restaurants, which narrowly surpassed Japan’s total of 9 restaurants. The Missing Piece in The Mozaic? Just a few months ago, Mozaic Bali was awarded a commendable 5th position on The Miele Guide 2013’s Asia’s Top 20 list. Like the Michelin Stars and S. Pellegrino - Acqua Panna’s 50 Best Restaurants, Miele Guide is another much coveted award in the fine dining world. Indonesians are probably wondering why Mozaic, located in Ubud, Bali is picked as the Best restaurant in Indonesia, but is the only restaurant from Indonesia and only made it to number 50 on the list. Honestly, I am wondering about it too, as I have never savoured the divine experience at the highly regarded establishment. The voting panelists at The World’s 50 Best Restaurants Academy are most likely, non-Indonesians and not as well versed about the true local fine dining scene as some local gourmands do. While the organizer claims that any restaurant in the world is eligible to be voted by the Academy, the fact that Mozaic is already known to international audience gives it an added advantage in the competition. Chris Salans occasionally flies in to the capital city for special events or stints outside Mozaic. When inquired about why he still has not ventured to Jakarta permanently, he bemoans that the crowd in the capital simply makes it impossible to be creative with locally sourced fresh ingredients, which is exactly his passion and forte. I personally agree with him, as the market in Jakarta still finds it mind-blowing to pay more than one million Rupiahs per person per meal, despite the actual purchasing power. Jakarta’s dining scene, as rapidly developing and evolving as it is seems, unfortunately still focuses on superficial qualities. The capital dwellers’ mindset is still at “to see and to be seen”. Jakartans do not dine and pay a fortune to indulge in anonymously divine gastronomic trances. The attitude is unlike that in Singapore, Hong Kong and Japan, all of which have become wholesome & developed spots for anything from creaky street food push carts to ethereal fine dining niches. This event would hopefully become a wake-up call for us to reflect on the way we perceive and enjoy food. As a true blue Jakartan, I secretly (might) still have that very mindset which deters the brilliant likes of Salans from reaching out to Jakarta. The next time I’m in Bali, I will make a point driving 2 hours north to Ubud and say hi to Chris. Who knows, he would be generous enough to feed me his locally sourced dishes like a dessert infused with Bunga Kecombrang or a main course with Buah Keluak in it. UK’s Restaurant magazine in 2002 initially started the World’s 50 Best Restaurants list as a part of its feature section. An awards night to celebrate the results soon evolved into an eagerly-awaited and prestigious awards presentation for the best chefs and restaurants from around the world. The list is created from The Diners Club’s World’s 50 Best Restaurants Academy. Each academy is made up of food critics, restaurateurs, chefs and highly regarded gourmands picked by each of the region’s chairpersons. Out of the 7 votes that the Panelists are entitled to cast, at least 3 must recognize restaurants outside their own region. Furthermore, to ensure fairness and validity, the panelists must have eaten at the places they’re voting for within the last 18 months when the vote was cast. 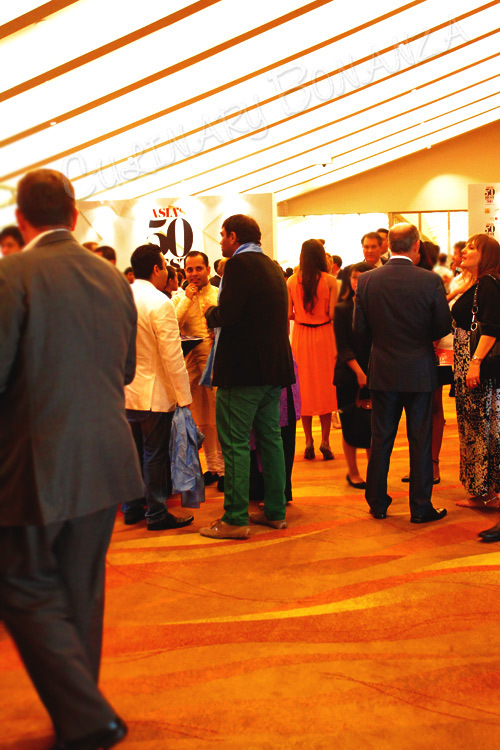 This year marks the inauguration of Asia’s 50 Best Restaurants, as a part of The World's 50 Best Restaurants Academy. These programs are exclusively sponsored by Italian premium mineral water brands S.Pellegrino & Acqua Panna and are organised by William Reed Business Media, which publishes Restaurant magazine in the UK. 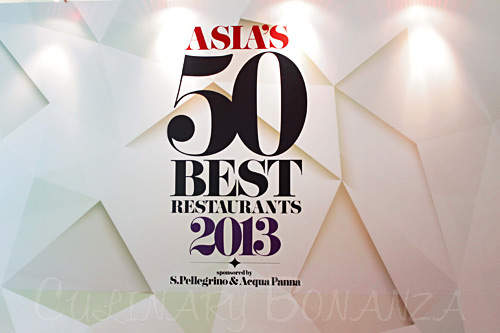 Asia's 50 Best Restaurants is compiled from the nominations by the global voting Academy in 25 countries in Asia. The 25 countries in alphabetical order are Bangladesh, Burma/Myanmar, Brunei, Cambodia, China, Hong Kong, India, Indonesia, Japan, Korea, Laos, Macao, Malaysia, Maldives, Micronesia, Nauru, Nepal, Pakistan, Philippines, Singapore, Sri Lanka, Taiwan, Thailand, Timor-Leste & Vietnam. 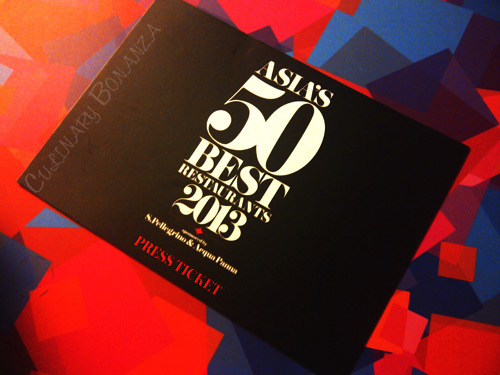 Until next year's Asia's 50 Best Restaurants report again! I a conversation with Will Meyrick I remember he also mentioned that Jakarta's restaurant are mostly institution's driven venues, unlike Bali that has many chef-driven restaurants. With him opening the E&O in Mega Kuningan, and personally man it, perhaps Jakarta could have a world class restaurant too?